Before we launched in Los Angeles, and before Charlotte welcomed us into the fold, we were students at Chapel Hill with a desire to Surprise. We wanted to surprise kids with a way to give back, even at an early age; we wanted to surprise invited guests with an opporunity to "gift back" that was meaningful and trasnparent; we wanted to surprise kids who would otherwise go without with unexpected birthday JOY. How would we do it? 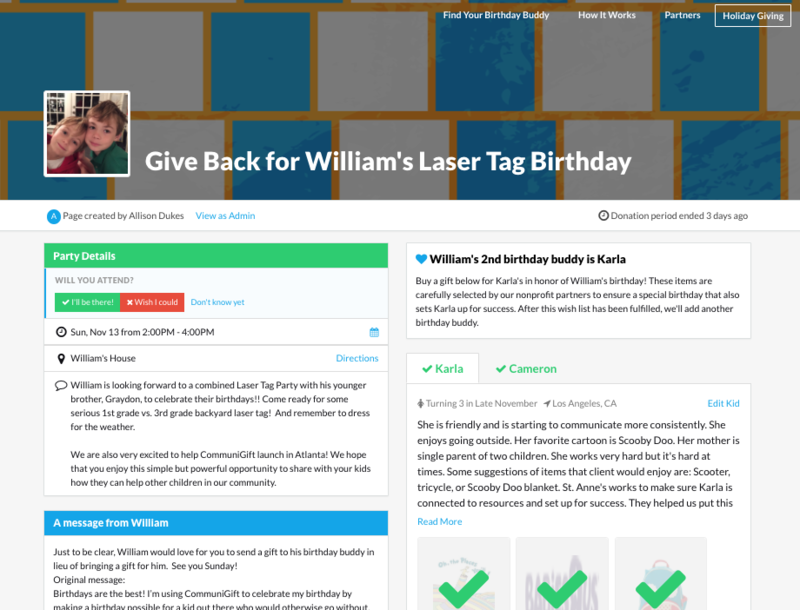 ... a kids' party invitation platform where party guests can RSVP and send a gift to a kid in need, all online in one place. A few clever moms heard what we were working on, shared the idea with their kids, and together decided to host the first ATL CommuniGift Birthdays (before we went live!). Working with our new Atlanta nonprofit partners, we had quietly added a few birthday buddies, and within hours saw our first hosts' party invitations go out. Guests began to RSVP and send gifts to Graydon and Williams birthday buddies. We smiled. Surprise # 2: Happy kids, happy parents! Allison, their mom, shared with us: "We actually had a conversation in the car today… [Graydon] asked if he would get a gift for doing the right thing. and I said ‘You get lots of gifts, this is about learning how to give with no expectation of receiving anything in return. And, he said “'I get it.'" It's so cool to see kids jumping at the opporunity to help others. Surprise # 3: "Shipment arrived." Kaniya, almost 7, is in for a surprise! Every day after school and throughout the summer, The Study Hall works to connect kids with opportunity. Their goal: sustained academic and personal success. Birthdays are not a given for many of the kids they work with every day, so the opportunity to celebrate them on their special day is quite special. "Everyone is thrilled about this new partnership," said Jacquetta Watkins, executive director at The Study Hall. Starting now, she’ll have the opportunity to lift up and celebrate her students on their birthdays. For our team, this delivery was the best surprise of them all. We paused, looked at each other, and smiled. 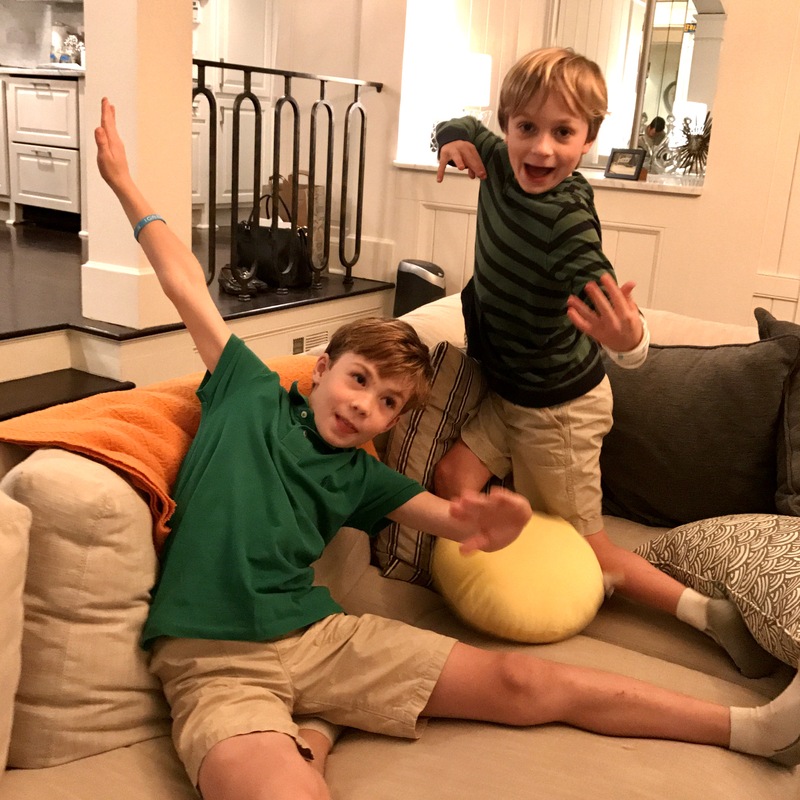 Receiving the notification that some of the first Atlanta gifts had arrived, all thanks to amazing kids like Graydon and William, was the perfect reminder of why we do what we do. To us, this has all been the perfect surprise. A special thanks goes out to the incredible people of Atlanta who have extended the warmest welcome we could imagine and helped make this possible. 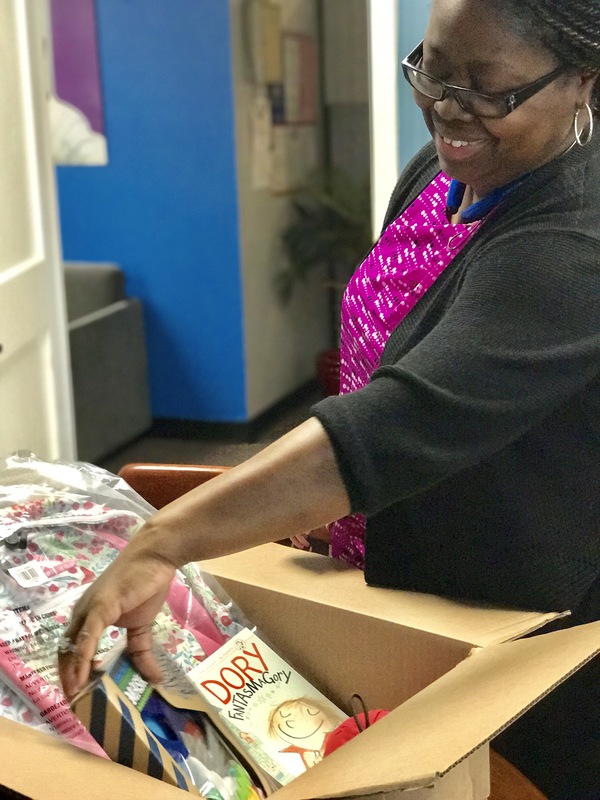 Thanks to: Pace Academy, The Parés, The Dukes, The Study Hall, Trinity School, Chattahochee Coffee Company, Lovett, Helping Mamas, Thunderbolt, Turo, The Schoens, Boys and Girls Clubs of Metro Atlanta, Heidi Hutchinson, Lori Fenzl, Alissa Portman, and so many more!